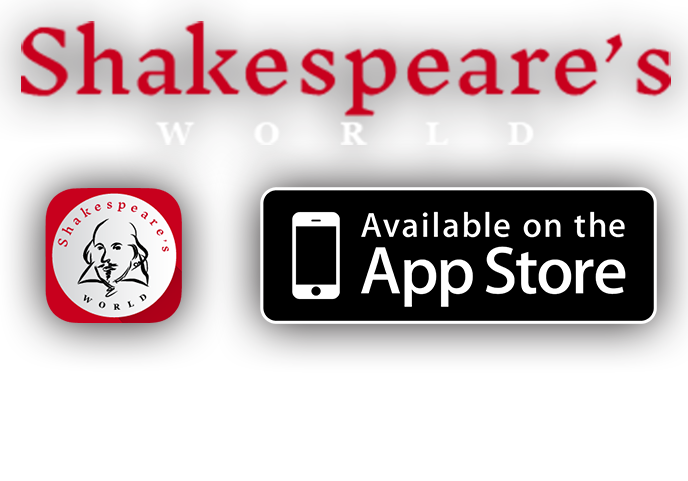 Shakespeare's World – The app that explores Shakespeare, his work, his times and places. For lovers of Shakespeare and lovers of history. 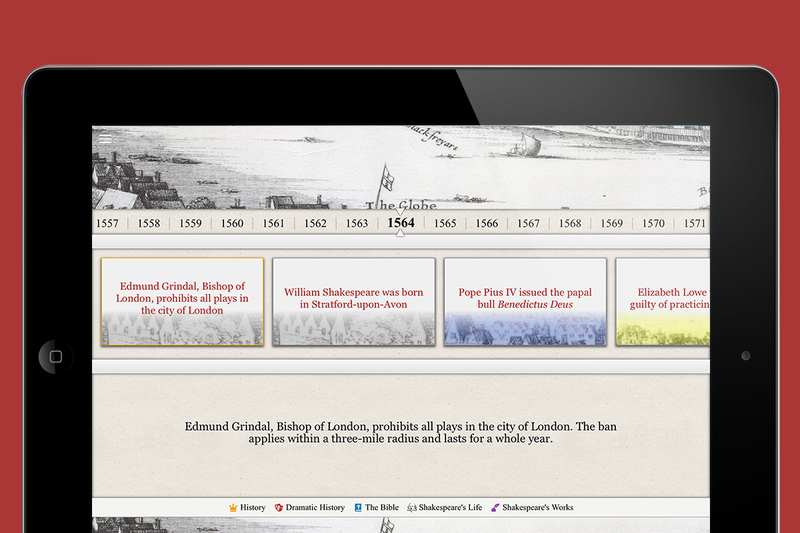 Shakespeare’s World for iPad is the only app to explore Shakespeare’s works and world through time and place. 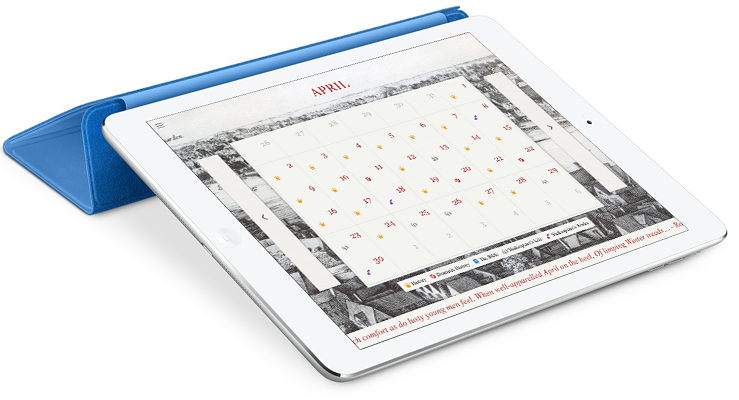 Historical events that impacted Shakespeare and his world feature on every day of the year. An interactive map allows you to trace Shakespeare’s movements and chart the evolution of his plays. Articles and guides to his plays foreground their historical context. Shakespeare’s World is the perfect companion for lovers of Shakespeare and lovers of history. Every day of the year looks back to a defining historical event in the fifteenth and sixteenth century. Events such as Henry VIII’s religious reforms in England and the Battle of Lepanto in the Mediterranean, as well as the publication of Shakespeare’s first works in London and his numerous law suits and business transactions. Cross-referenced to the interactive map, you can view the far-reaching events that shaped his works and impacted his world. Chart Shakespeare’s journeys to and from London and Stratford-upon-Avon and his travels around England on tour with the Lord Chamberlain’s Men. Visit the royal palaces and great houses he performed in with his playing company, from Hampton Court and Whitehall to Wilton House and Hunsdon House. Travel to locations around the world that feature in Shakespeare’s plays and world. 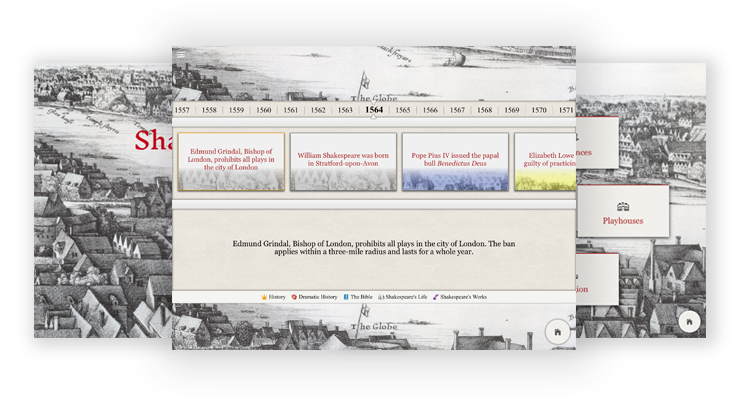 The map also provides a virtual tour of Shakespeare’s life. View some of the defining events of the fifteenth and sixteenth centuries alongside events in Shakespeare’s life. Cross-referenced to the calendar, all events link back to Shakespeare and his plays. Jousts, jesters and saints from medieval England, and merchants, martyrs and witches from early modern England all feature in the timeline. Explore how key events in the fifteenth and sixteenth century influenced Shakespeare and feature in his works. A chronological gallery links to key events in Shakespeare’s life, as well as the fifteenth and sixteenth centuries. Read short, scholarly articles on aspects of Shakespeare’s world, including early modern playhouses, actors and playing companies. Guides to Shakespeare’s plays offer synopses and foreground historical context. A full bibliography provides suggestions for further reading and details the scholarly research that underpins the app.